MARC is holding the first Partners Congress, to learn more about Creating Sustainable Places and provide your input — through facilitated breakout sessions and electronic polling. Sustainable places require good transit options. Who Should Attend: Anyone from the public or private sector who is interested in creating a more resilient and adaptable region. Registration: There is no cost to attend, but registration is required. Register online or call 816-701-8234. The Kansas City Area Transportation Authority (KCATA) and the Unified Government of Wyandotte County-Kansas City, Ks. (UG), are holding an open house to discuss preliminary design plans for the Minnesota/State Avenue transit corridor. When: Tuesday, June 7, 2011, 4 p.m. to 6 p.m.
Who Should Attend: Any area residents, businesses and commuters wanting to review project exhibits and provide comment. KCATA and UG staff, along with consultant design team members, will be on hand to answer questions and discuss issues and/or concerns. We Rank 90th of 100 – Is Anybody Surprised? 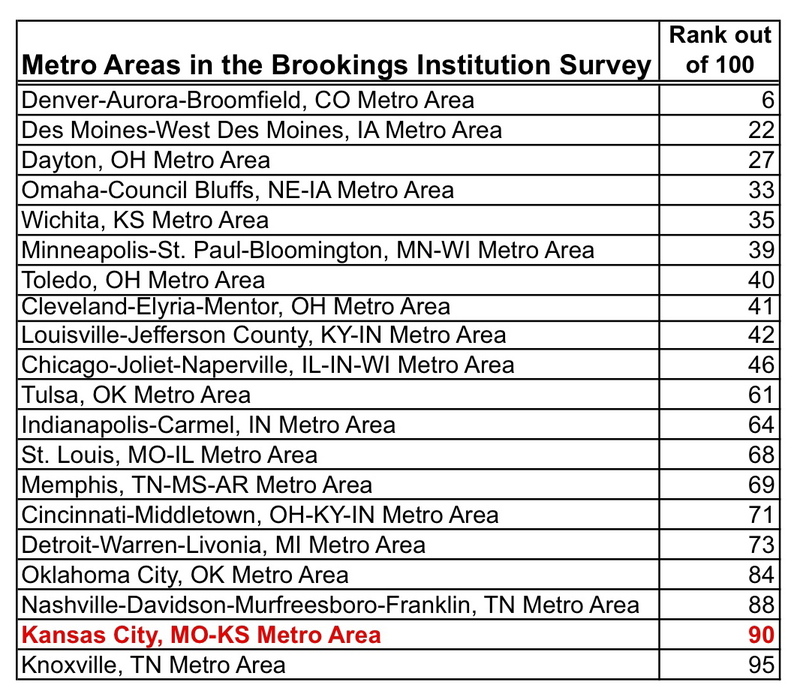 Last week the Brookings Institution released a report, Missed Opportunity: Transit and Jobs in Metropolitan America, examining the ability of America’s 100 largest cities to get people to work by transit. It should come as no surprise to residents of the Kansas City region that we came in 90th. The Brookings report is not about quality, as Huffer notes. The KCATA customer satisfaction is over 90%, its buses are on time over 92% of the time and the cost per mile is significantly under the national average. This report is about quantity of transit service. We don’t have enough transit in the region to get people to work. This problem directly relates to a lack of transit funding. Our region provides very little money for transit compared to our peer cities. Mr. Huffer cites the need for a regional funding mechanism, and TAN agrees wholeheartedly. MARC proposed a regional transit concept and funding strategy over 10 years ago with Smart Moves. Some parts of that plan are gradually being implemented, like the MAX buses, but funding has remained elusive. Nothing major can change without more money. The big question is how the region will respond to being ranked 90th. Will the region’s leaders shrug and proceed with business as usual? Or will they take the ranking seriously as a challenge to our viability as an urban region, roll up their sleeves, and confront the problem. We have an abundance of ‘good intentions’ already in place including MARC’s new policy direction regarding future development, a new Long Range Transportation Plan, the recent HUD Sustainable Communities Planning grant, the First Suburbs Coalition, Imagine KC, multiple Alternatives Analysis studies, multiple phases of Smart Moves, and even a broad-based regional commitment to being America’s Green Region. But are they enough? Will good intentions translate into actions? We have not developed a transit system relevant to our region’s population or our situation. The Kansas City region has sprawled out in every direction, and therefore lacks the density needed for some of the more capital-intensive transit infrastructure investments. Unfortunately, jobs have sprawled along with residents and retail, and “job sprawl” is especially hard to serve by transit. Even better transit to downtown would address only part of the problem since fewer than 14% of the region’s jobs are now located in Kansas City’s Central Business District. Getting people to jobs that are dispersed all over the region makes for a daunting task for our underfunded transit agencies. What do we do? The Brookings Institution makes three main recommendations, but will we move to implement them? Transportation leaders should make access to jobs an explicit priority in spending and service decisions, especially given the budget pressures they face. Metro leaders should coordinate land-use, economic-development, and housing strategies with transit decisions to ensure transit reaches more people and more jobs efficiently. Federal officials should collect and publicize standardized transit data to enable public, private and nonprofit entities to make more informed decisions and maximize the benefits of transit for labor markets. – Evaluate the methodology used by Brookings to be sure it doesn’t misrepresent us. – View this low ranking as a challenge to improve public transit and, at least as important, assure that most of the region’s future development is accessible by transit. – Accept that we have not provided a realistic transit choice for getting most people to work, and increase our efforts to get broad-based transit funding, perhaps county-by-county. – Acknowledge the “good intentions” that the region has in place, but carefully examine whether they are enough, and then adopt new policies and actions as necessary. – Adopt and implement a set of measures to track our progress toward improving our ranking. If we measure it, we have a lot better chance of making progress. The Brookings report and a regional response will be the major issue for discussion at the June meeting of MARC’s Transit Committee. TAN will be there and actively participating in the discussion. 1. Tom Gerend, MARC Assistant Director of Transportation, gave a short update on the Downtown Corridor (Streetcar) Alternatives Analysis. Tom clarified the report in the KC Star about the line costing $25 million per mile. It is important to distinguish between single and double tracked routes. This $25 million cost is more relevant to single track routes, like a loop. This study is looking at tracks running in both directions, double tracked. The route may be 2 miles long but there are 4 miles of track. The cost per track mile will vary greatly depending on whether the track bed is built to a streetcar or a light rail standard. All of these options are going to be studied. NOTE: A previous streetcar presentation at the Transit Committee by a different consultant estimated the cost of a streetcar with double tracks and built to light rail standards at $40 million per route mile, an estimate of $80 million for a two-mile route with these characteristics. 2. Mark Swope, Olsson Associates, gave an update of the Smart Moves Implementation Phase III Study. This study brings together the Phase I Urban Corridors Bus Rapid Transit study, Phase II Commuter Corridors/Commuter Rail Study and Local Services, including paratransit. The regional plan will detail preferred service strategies and include a corresponding financial analysis including developing financial funding scenarios. Mark presented information breaking down both operating and capital costs by county through 2020 using the transit scenarios from the previous studies. 3. After the main meeting the Seamless Transit Workgroup met to continue discussions related to making transit work more easily for riders. KCATA and JCT have been working together to post additional JCT schedule information. 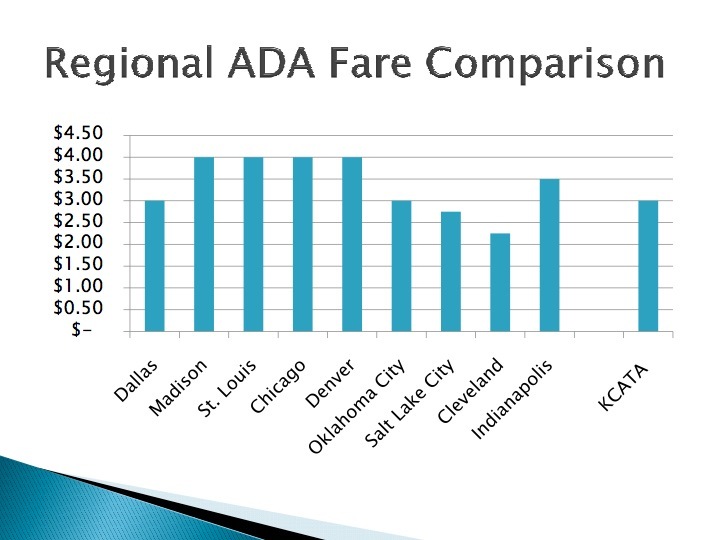 KCATA and JCT are discussing the possibility of a reciprocity agreement to allow riders to use monthly passes on either service. JCT is working on improvements to “basic passenger infrastructure” at bus stops, including improved signs, route and schedule information, and concrete pads to connect sidewalks to the street. Bus stops with a higher level of service would get additional amenities. In the discussion regarding real-time information through mobile devices, the transit providers explained that they use different technologies to communicate with riders. In the near term, any real-time information will be provided separately. 1. During public comment, Ron McLinden, Transit Action Network, asked the board to initiate a unilateral 90-day trial period in which KCATA honors Johnson County Transit monthly passes on Main Street MAX buses. A limited trial could be implemented at little or no cost, and would be an important symbolic step toward improving the region’s transit system by making transit a more viable option for more people. The Board agreed to consider the request. 2.The board authorized a contract to purchase eight 2011 Dodge Caravan passenger vans for use in the KCATA”s AdVantage Vanpool Program. The eight vehicles in the current fleet of 33 vehicles have exceeded their 100,000-mile and four-year useful life. The AdVantage Vanpool Program is available to commuters who either reside or work in a community supporting the KCATA through service agreements, and who do not have access to existing public transit services for their commute trip. 3. The Board of Commissioners authorized a cooperative agreement for a KU Medical Center Area Transit Study toward the goal of improving transit service for those working in and around the medical center and improving connections between current transit routes. The study arose from discussions between Mayor Reardon of Kansas City, Kansas, and Mayor Foster of Roeland Park about improving transit service for those working in and around the medical center and improving connections between current transit routes. KCATA, MARC, Johnson County Transit, the City of Roeland Park, and the Unified Government have jointly developed a scope for a consultant to analyze options to improve transit services to KU Medical Center for nearby residents, employees, and visitors and to improve transit connections. HNTB has been selected to conduct the study under their on-call services contract with KCATA, at an estimated cost of $72,500. The study is to be completed this fall. Federal planning funds will be used for 80% of the cost with remaining local funds to be provided by the Unified Government, Johnson County Transit, the City of Roeland Park, and KCATA. 4. The Board of Commissioners authorized a service contract with the City of Kansas City, Missouri, from May 1, 2011, to April 30, 2012, with a City contribution of $43.1 million. From the 1/2 cent sales tax the contract includes $19.9 million for Metro, $1.9 million for Share-A- Fare and $40.2 thousand to fund specialized services for reverse-commute job transportation. There is $21.3 million from the 3/8-cent sales tax for public transportation. This contract is an increase of 6.2% over last years contract. 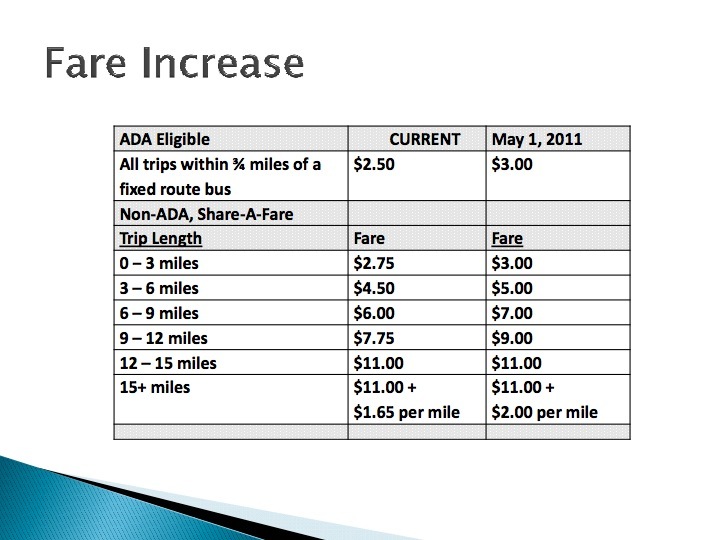 Part of that increase is due to the ordinance passed in December 2010 to restore funding to public transit and part is due to higher sales tax revenues. Keep in mind that this contract is still less than the 2004/2005 Kansas City contract. 6. Cindy Baker, KCATA Director of Marketing, made a presentation on the State Avenue corridor project, funded by TIGER grants. It is in the design phase and the design team will soon be meeting with Advisory Council, stakeholders, and the general public. One component of this phase is the branding that will go hand in hand with design and then implementation. This project includes transit infrastructure improvements that could serve as a precursor to a future MAX line. Johnson County Transit is in a similar situation with their Shawnee Mission Parkway/Metcalf route, also a TIGER-funded improved-transit corridor, but not full BRT service. The JO has been working with consultants and the public to brand their new line. They have opted to call it “The JO Connex”. KCATA, Unified Government, and Johnson County Transit are all amenable to developing a regional brand, called “Connex,” that would represent a family of routes that include enhanced transit amenities, but do not increase service levels to MAX standards. Next meeting May 25, 2011.